Our results 17th chicken, got a great call with 3rd place ribs, 63rd pork and 65th brisket, 29th overall. Really felt good going into awards, especially about our pork turn-in. Just goes to show, you never know. We also competed in the "I know jack about grilling" contest. It's a blind box one hour cook, where we had to prepare an entry, side and dessert. We were given Rack of Lamb. Came in second which we felt pretty good about, considering our gas grill didn't work. We had to cook everything on a Primo grill. Had a great time, Tennessee is a beautiful state, and the folks at Jack Daniels really spoil ya. Last edited by Meat Man; 10-27-2015 at 03:41 PM. awesome thing to share with the family! Sounds like you had a great time, now matter how you scored in the pork. I'd have liked to have seen that "I know jack about grilling" contest. Just to be there is something! I've heard it's quite a spectacle and easy to loose focus with all the things that surround the event! Sounds like you had a great time! Tell me how it was to turn in both light and dark meat chic entry? Sterling I was kinda surprised, it really was a cool family fun event. I thought there would be a lot of partying going on, but a lot of teams brought their families. That was kind of refreshing. It was really fun Tent, you were allowed to bring one ingredient and one item. We brought bacon and our house rub from the store. The box had rack of lamb, potatoes, squash, zucchini, asparagus, peaches, cool whip, butter, brown sugar, salt and pepper, and honey jack whiskey. We did a simple preparation, and nailed everything but the peaches. Just didn't get them soft enough and couldn't get the the caramel quite hot enough without a burner. Scooter we decided to go with breast using Chris Lilly's little trick. A lot of teams do wings, but we cook a lot of chicken breast at home, so we were pretty comfortable doing that. I didn't want to do smaller thighs, so I trimmed them a little shorter, which was a good thing since the boxes were a littler smaller than usual. 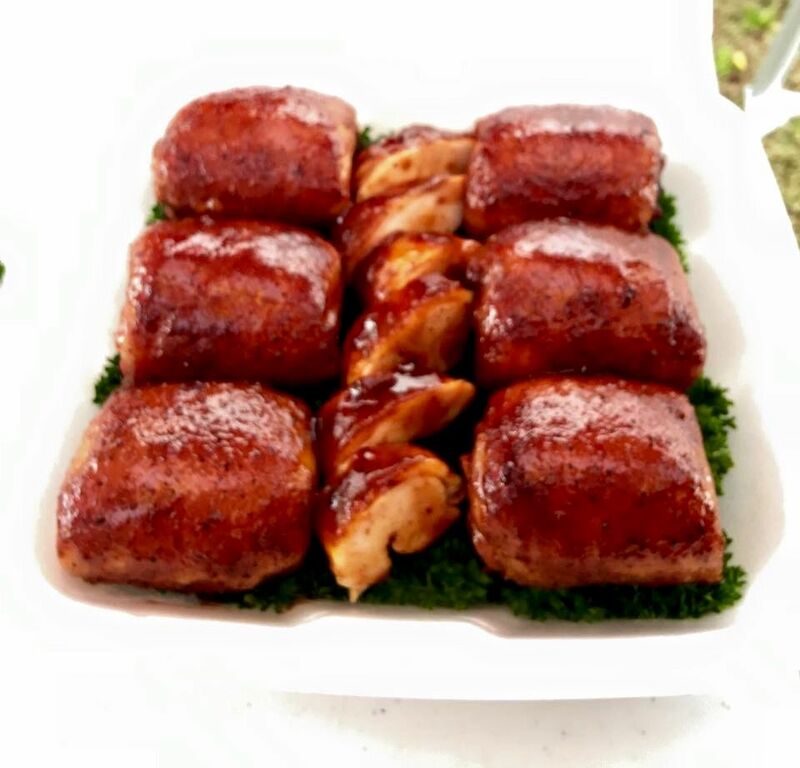 We hadn't put breast meat in a comp box in a couple of years, so we practiced a couple of times to get the timing down. It went together pretty easily. Last edited by Meat Man; 10-27-2015 at 09:24 PM. I ate a peach Will/Amy cooked. I thought it was wonderful! Meat Man, can you tell me what Chris's little trick is? I met him over the weekend in FT Worth along with lots of other great cooks (and people). thanks. I won't tell you the trick, but I'll show you the box. It's not a very good picture, but it's the only one I have. The chicken turn in kind of confused me. You see the Jack requires seven pieces of meat for each turn in, they also require breast meat as well. There's no way I could get seven thighs and breast meat in a box. Sometimes I'm kinda slow. Reread the rules, at least seven pieces.